Gun slingers and saloon madams galore. 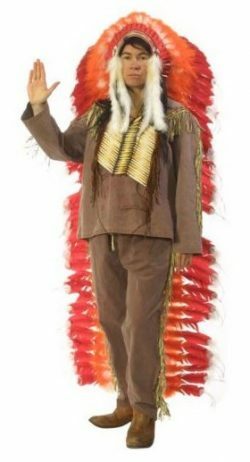 Indian Chief outfit including long sleeve top and pants with fringing. Accessories that can be added to this include bone chest piece and full length feathered head-dress. Perfect for Indian Chief Geronimo or from the Village People. 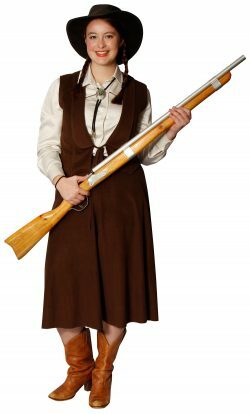 Annie Oakley was an American sharpshooter and exhibition shooter which led to a role in Buffalo Bill’s Wild West show. The costume comes complete with waistcoat, shirt and culottes. Add a western rifle to complete this famous characters look. Mens top and pants with loin cloth detail in a tan colour made of suede-like material with fringing and braiding. Feathered head gear or a black wig complete the indian ensemble. Very cute black and white cow-print chaps for women with matching waistcoat, scarf and cowboy hat. Brown large cow print chaps, waistcoat and wristbands with fringing. Perfect with cowboy hat and rifle for cowgirl Annie Oakley. 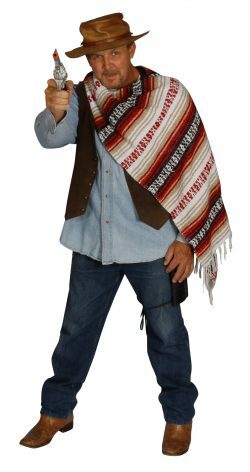 Mexican red, white and black Mexican poncho, blue denim shirt, hat,western waistcoat and accessories. 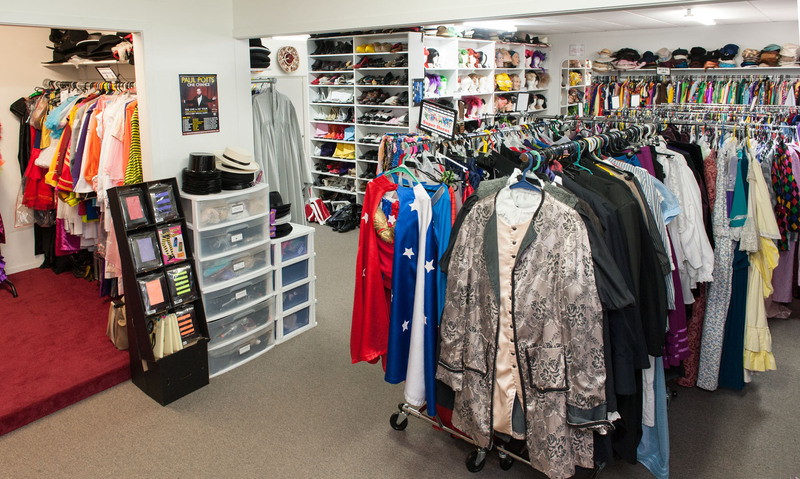 Dress as Clint Eastwood for your western party. Cowboy ensemble made up of denim shirt, brown leather vest, black tassled chaps, red bandana and cowboy hat. Works wonderfuly as the cowboy from the Village People or John Wayne. 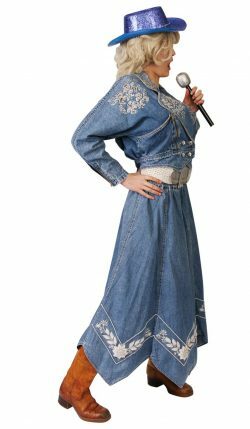 Dolly Parton denim beaded jacket and matching long panelled skirt. Add the character Dolly wig, belt, boots and cowgirl hat. A great Western or music theme costume choice. A real western themed team with the Highway Man complete costume and the burgundy bustled skirt and corset Madam set. Add a cowboy hat and set out west. Deluxe Indian chief tunic top and pants with front panels set. 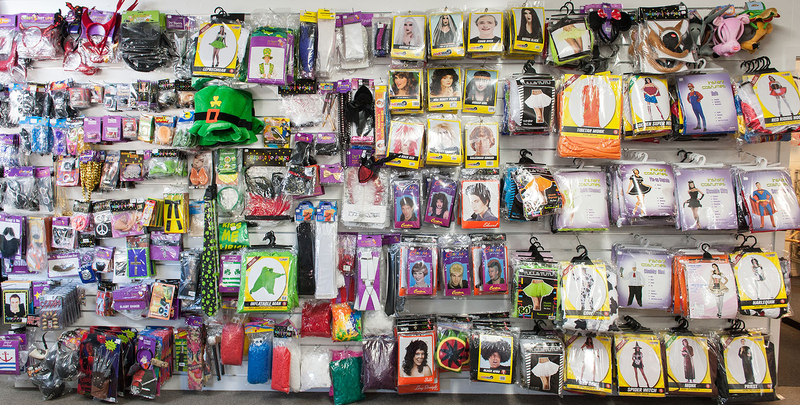 Add the full length feather head dress, bone chest plate and some face paints to your costume. 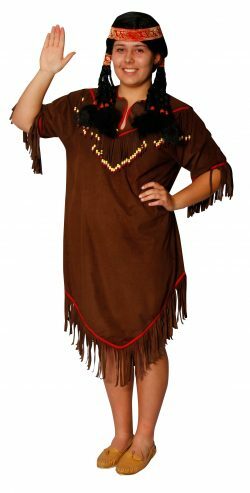 Dark brown seudette Indian squaw dress with yellow trims and bead tassles. Add a wig and an axe. 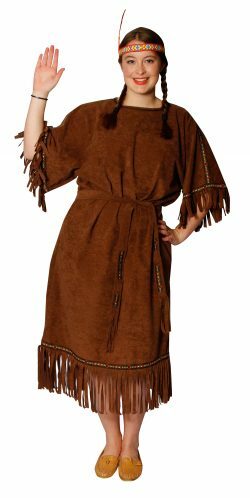 Brown Indian girl dress with fringing and bead detail. Add a dark wig with plaits to complete your look. Brown Indian girl dress with matching belt. Add a wig with plaits and a headband to complete your look.